Ice cream, shakes, cones, sundaes, pies, smoothies, parfaits and more! A discounted Baskin Robbins gift card will give you more ice cream goodies for less money! They are the world’s largest chain of ice cream shops and have over 7,300 locations worldwide with 2,500 in the United States alone. Known as ’31 flavors’, they have over 300 million customers each year- and for good reason! With ice cream based menu items such as Caramel Cappuccino Blast, Chocolate Chip Cookie Dough Sundae, Mango Banana Smoothie and Oreo Layered Sundae, to name a few, they have something for everyone! Purchase a Baskin Robbins gift card, and you will get the same great treats while spending less money! Founded in 1945 in California, by Burt Baskin and Irv Robbins, who believed customers should sample ice cream flavors before placing their orders, and thus, the little pink spoon was born! Today, you can still try ice cream flavors in exciting combinations you’re sure to love. How about a Donut Ice Cream Sandwich or a Jamoca Almond Fudge Heath Polar Pizza? 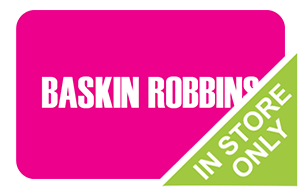 Buy a Baskin Robbins gift card and choose your favorite item for less money out of your pocket! Don’t forget about their superb ice cream cakes too! And what’s more, you can order online for simple pick up! When you buy your Baskin Robbins gift card from Cards2Cash, you can rest assured that you will save money! And just think, you can use any coupons you have and still use your gift card! With Cards2Cash, saving money is easy! We also offer discounted gift cards for other retail stores you know and love! Be sure to check out our listings for Cold Stone, Dairy Queen, Tropical Smoothie, and more! With Cards2Cash, saving money is as easy as 1-2-3! Looking to Sell your Baskin Robbins Gift Card? Do you have a Baskin Robbins gift card you aren’t going to use? Cards2Cash will buy your card and put money in your pocket! We pay top dollar for gift cards to a variety of stores and restaurants. If interested, visit one of our retail locations, and we’ll pay you cash for your unwanted card, OR fill out our online form, and we’ll get back to you with an offer you can’t refuse! Whether you buy a gift card or sell one, Cards2Cash is your one-stop gift card shop!